What am I talking about you ask? Mabuhay Miles MasterCard is giving away hundreds of thousands of pesos and hundreds of thousands of Mabuhay Miles from PNB’s and Allied Bank’s My Perfect 10 Buy Promo to kick off its 10th anniversary. It’s very easy to join! 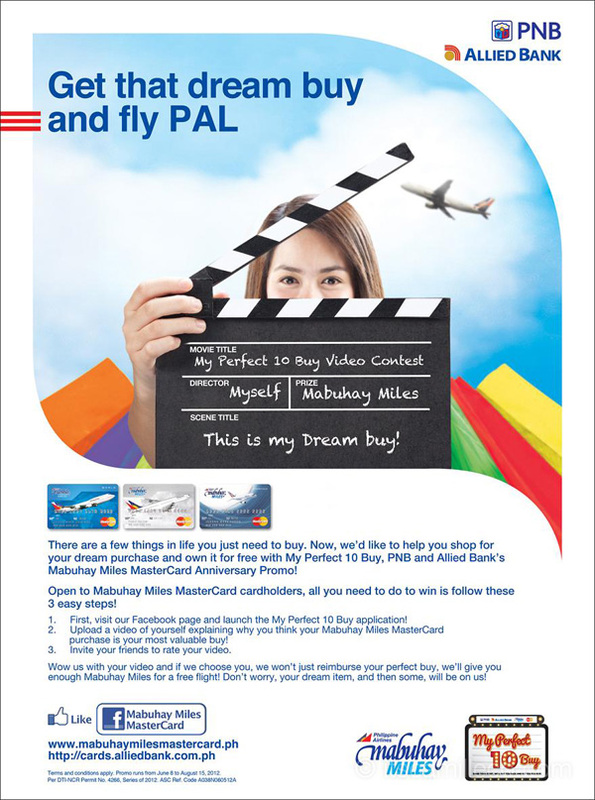 All you have to do is share on video what your most valuable or meaningful purchase through Mabuhay Miles Mastercard is. It can be anything! LIKE Mabuhay Miles MasterCard on Facebook. Launch the “My Perfect 10 Buy” application tab on Mabuhay Miles MasterCard’s Facebook page. Make sure to read the mechanics. Submit a 30-second to 2-minute video sharing your most valuable purchase made through Mabuhay Miles MasterCard. Invite your friends to view your entry and rate it! The more video entries you submit, the higher your chances are of winning! Just remember to feature different purchases and products each time you submit a new video. If you need some inspiration, check-out how other cardholders made their videos here. Ten winners will be picked from all the entries. The top three winning entries will receive the amount of the purchased item or PhP 100,000 (whichever is lower) plus 100,000 Mabuhay Miles. The fourth to sixth winning entries shall receive the amount of the purchased item or PhP50,000 (whichever is lower) plus 50,000 Mabuhay Miles. The seventh to ninth winning entries shall receive the amount of the purchased item or PhP 30,000 (whichever is lower) plus 30,000 Mabuhay Miles. The tenth winning entry shall receive the amount of the purchased item or PhP 10,000 (whichever is lower) plus 10,000 Mabuhay Miles. All prizes shall be credited to the winner’s Allied Bank/PNB Mabuhay Miles MasterCard. Miles are non-transferable and not convertible to cash. For more information on promo guidelines, visit the Mabuhay Miles MasterCard Facebook page. This nationwide promo is open to all Mabuhay Miles MasterCard cardholders and will run until August 15, 2012 only.